• Understand the relationship between body condition scores and rebreeding efficiency. • Learn what different body condition scores look like by viewing cattle at different scores. Better understanding of the relationships between body condition scores and rebreeding efficiency of beef cattle has added a powerful management tool to the cattleman’s arsenal. Condition scoring permits the cattleman to evaluate the nutritional program each time the herd is seen. By evaluating cow condition at strategic times of the year, it is possible to coordinate use of the forage resource with nutritional needs of the cow herd so that supplemental feed and hay needs are reduced to a minimum. Body condition scores (BCS) are numbers used to suggest the relative fatness or body composition of the cow. For BCS to be most helpful, producers need to calibrate the system under their own conditions with their own cattle. A nine-grade system is commonly used by researchers in the United States. 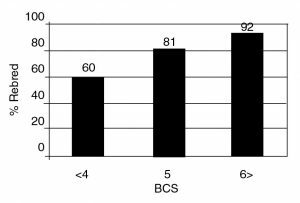 When using the BCS, producers should keep the program simple. A thin cow looks very sharp, angular, and skinny, while a fat cow looks smooth and boxy with bone structure hidden from sight or feel. 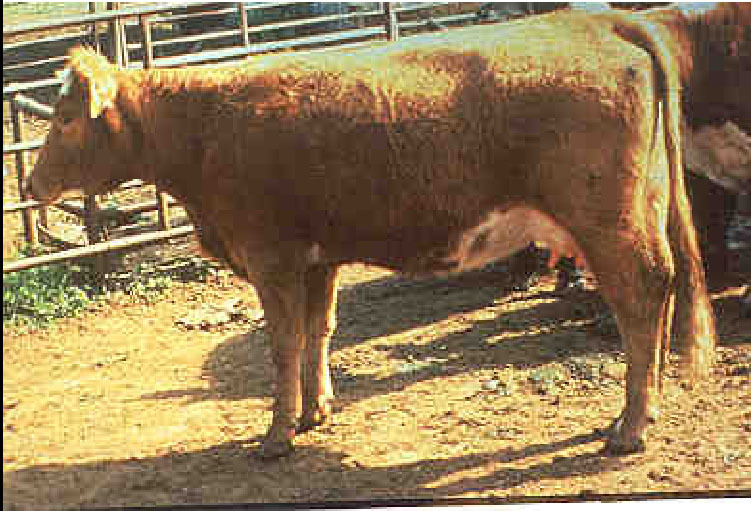 The key areas to examine the beef cow for body condition score are illustrated in Figure 1. Figure 1. Key areas to examine for body condition scoring. Specifically look to see how many ribs (from the last half of the rib cage) are evident to visual appraisal. If more than two ribs are easily discernible, then expect the cow to score lower than five. Also look closely at the spinous processes (vertebrae along the edge of the loin in front of the hook bones). If the outline of the vertebrae is visually apparent, expect the cow to receive a body condition score of four or lower. SCORE 1. The cow is severely emaciated and physically weak with all ribs and bone structure easily visible. Cattle in this score are extremely rare and are usually inflicted with a disease and/or parasitism. SCORE 2. 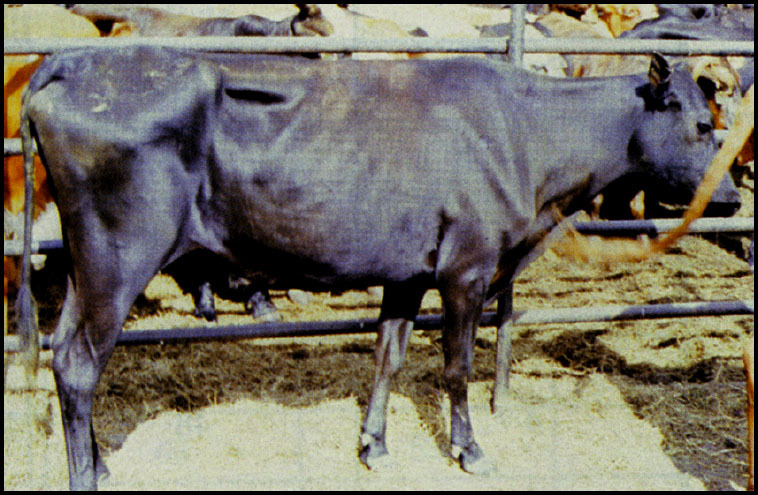 (Figure 2) The cow appears emaciated, similar to BCS – 1 described above, but not weakened. Muscle tissue seems severely depleted through the hindquarters and shoulder. Figure 2. BCS – 2. Photo courtesy of Arkansas Extension Service. SCORE 3. 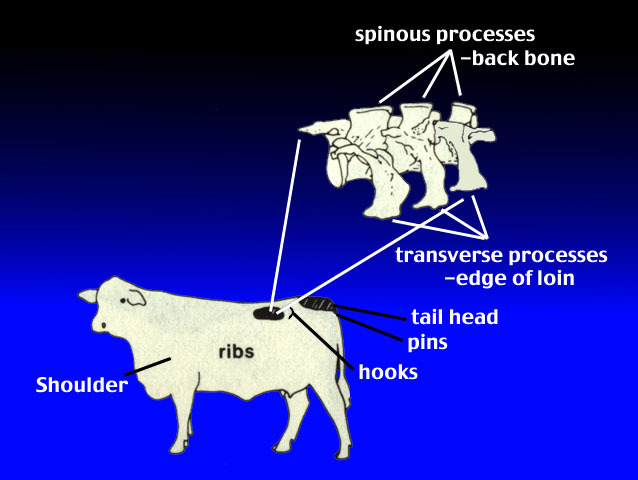 (Figure 3) The cow is very thin with no fat on ribs or in brisket and the backbone is easily visible. Some muscle depletion appears evident through the hindquarters. Figure 3. BCS – 3. Figure 4. BCS – 4. SCORE 5. 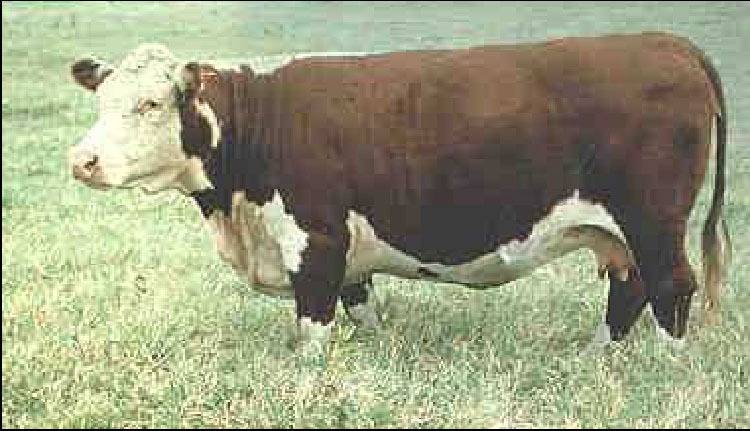 (Figure 5) The cow may be described as moderate to thin. The last two ribs can be seen and little evidence of fat is present in the brisket, over the ribs, or around the tail head. The spinous processes are now smooth and no longer individually identifiable. Figure 5. BCS – 5. SCORE 6. 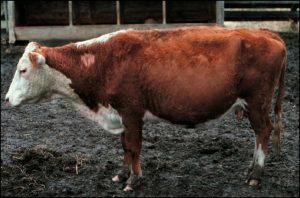 (Figure 6) The cow exhibits a good smooth appearance throughout. Some fat deposition is present in the brisket and over the tail head. The back appears rounded and fat can be palpated over the ribs and pin bones. Figure 6. BCS – 6. SCORE 7. (Figure 7) The cow appears in very good flesh. The brisket is full, the tail head shows pockets of fat and the back appears square due to fat. The ribs are very smooth and soft handling due to fat cover. Figure 7. BCS – 7. SCORE 8. The cow is obese. Her neck is thick and short and her back appears very square due to excessive fat. The brisket is distended and she has heavy fat pockets around the tail head. SCORE 9. These cows are very obese and are rarely seen. They can be described as similar to eight but taken to greater extremes. They also have a heavy deposition of udder fat. There is controversy about whether cattle need to be felt to determine fatness (Figure 1) or if they can simply be looked at to assess condition scores. A recent study indicated that cattle could be separated equally well by palpation of fat cover or by visual appraisal, but the set point or average score may vary slightly depending on the method used. For cattle with long hair, handling is of value, but when hair is short, handling appears to be unnecessary. Keep in mind that shrink can alter the looks and feel of the cattle as much as one score. Animals in late pregnancy also tend to look fuller and a bit fatter. 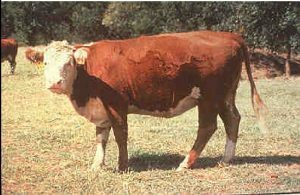 One of the major constraints in the improvement of reproductive efficiency of beef cows is the duration of the post-calving anestrous period. If cows are to maintain a calving interval of one year they must conceive within 80 to 85 days after calving. Body condition at calving time determines to a great extent the rebreeding performance of beef cows in the subsequent breeding season (Figure 8). Figure 8. Percent rebred at next breeding season according to body condition at calving (summary of six trials in 4 states) BCS = 4 or less, BCS = 5, BCS = 6 or more. This graph represents the rebreeding percentage of six research herds (four states) and includes mature as well as young cows. It shows clearly that the body condition at calving greatly determines the rebreeding percentage of cows during the subsequent 60 to 90 day breeding season. 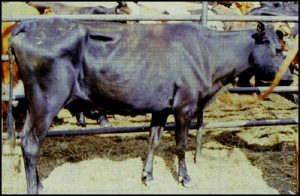 Based on research with mature and young cows, cows that maintained body weight, and therefore ample energy reserves before parturition, exhibited estrus sooner than cows that lost considerable body weight and consequently had poor energy reserves. Body weight change during pregnancy is confounded with embryo and placenta growth. Therefore, the estimation of body fat by use of body condition scores is more useful in quantifying the energy status of beef cows. The numeric system of body condition scoring is an excellent estimator of percentage body fat in beef cows. Body condition score accounted for 85 to 91% of the variation in stored body energy (percent fat) in cows. The processes of fetal development, delivering a calf, milk production, and repair of the reproductive tract are all physiological stresses. These stresses require the availability and utilization of large quantities of energy to enable cows to be rebred in the required 85 days. Added to those physiological stresses is the environmental stress of cold, wet weather on spring calving cows. In normal cow diets, energy intake will be below the amount needed to maintain body weight and condition. As the intake falls short of the energy utilized, the cow compensates by mobilizing stored energy or adipose tissue, and over a period of several weeks, a noticeable change in the outward appearance of the cow takes place. This is a change in the body condition and can be monitored by assigning body condition scores to cows and quantifying the degree of change. Cows that are in a thin body condition at calving return to estrus slowly. Postpartum increases in energy intake can modify the length of the postpartum interval. However, increases in the quality and quantity of feed to increase postpartum body condition can be very expensive. Improvement in reproductive performance achieved by expensive postpartum feeding to thin cows may not be adequate to justify the cost of the additional nutrients. 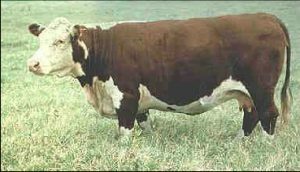 Oklahoma scientists used 81 Hereford and Angus x Hereford heifers to study the effects of body condition score at calving and postpartum nutrition on rebreeding rates at 90 and 120 days postpartum. Heifers were divided into two groups in November and allowed to lose body condition or maintain body condition until calving in February and March. Each of those groups was then redivided to either gain weight and body condition postpartum or to maintain body condition postpartum. Figure 9 illustrates the change in body weight of heifers that calved in a body condition score greater than five or those that calved in a body condition score less than or equal to 4.9. The same pattern that has been illustrated in the other experiments is manifest clearly with these heifers. Thin heifers that were given ample opportunity to regain weight and body condition after calving actually weighed more and had greater body condition by eight weeks than those heifers that had good body condition at calving and maintained their weight through the breeding season. However, the rebreeding performance (on the right side of the legend of the graph) was significantly lower for those that were thin (66%) at parturition compared to heifers that were in adequate body condition at calving and maintained condition through the breeding season (91%). Again postpartum increases in energy and therefore weight and body condition gave a modest improvement in rebreeding performance, but the increased expense was not adequately rewarded. The groups that were fed to “maintain” postpartum condition and weight received 4 lb of cottonseed meal supplement (41% Crude Protein; $.13/lb) per day. Figure 9. Postpartum body weight of heifers with body condition < 5 or ≥ 5 at calving and fed to gain or maintain weight. Pregnancy rates are indicated on the right side of the legend. Source: Bell. The supplement cost for the 69 day feeding period was approximately $36 per cow for the “maintain” group. The cows in the “gain” groups were fed 28 lb/day of a high energy diet (12% CP; $.073/lb) at a total supplement cost of $141. Both groups had free choice access to grass hay (personal communication). The improvement in reproductive performance (66% pregnant vs. 36% pregnant) of the thin 2-year-old heifers was not enough to offset the large investment in feed costs. Other data sets have shown conclusively that cows that calve in thin body condition but regain weight and condition going into the breeding season do not rebreed at the same rate as those that calve in good condition and maintain that condition into the breeding season. 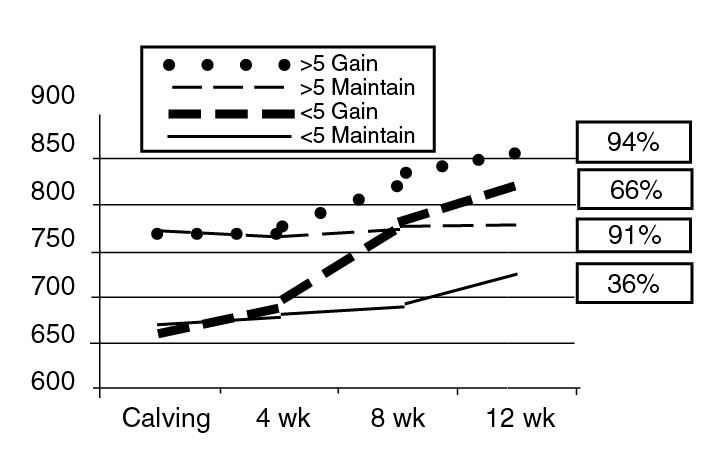 Table 1 from Missouri researchers illustrates the number of days between calving to the return to heat cycles depending on body condition at calving and body condition change after calving. Table 1. Predicted number of days from calving to first heat as affected by body condition score at calving and body condition score change after calving in young beef cows. (body condition score scale : 1 = emaciated; 9 = obese). Source: Lalman. This data clearly shows that young cows that calve in thin body condition (BCS=3 or 4) cannot gain enough body condition after calving to achieve the same rebreeding performance as cows that calve in moderate body condition (BCS = 5.5) and maintain or lose only a slight amount of condition. Cows must be rebred by 85 days after calving to calve again at the same time the next year. Notice that none of the averages for cows that calved in thin body condition were recycling in time to maintain a 12-month calving interval. Cows should have a body condition score of 5 to 6, and first calf heifers should have a body condition score of 6 at calving time. It is very expensive and very difficult to regain body condition after calving and still achieve an acceptable rebreeding percentage. Bell, D., et al. 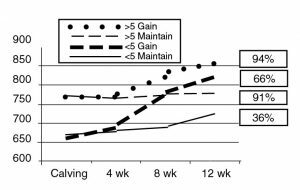 Effects of Body Condition Score at Calving and Postpartum Nutrition on Performance of Two-Year-Old Heifers. OSU Animal Science Research Report MP-129. Lalman, D.L., et al. 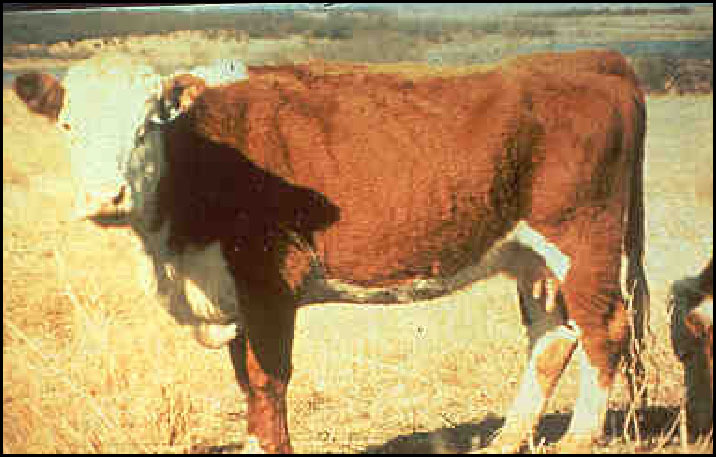 (1997) Influence of Weight and Body Condition Change on Duration of Anestrus by Undernourished Suckled Beef Heifers. Journal of Animal Science 75. Selk, G.E., et al. (1988) Relationships among weight change, body condition and reproductive performance of range beef cows. Journal of Animal Science 66:3153.